A relaxing and soothing body wash. Faith in Nature's Lavender & Geranium Body Wash contains ingredients that are 99% from natural origin and uses essential oils for fragrance. Please note; Faith in Nature are updating their labels. The bottle you receive may reflect either image shown. 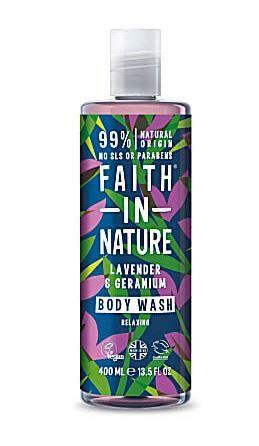 How to use Faith in Nature Lavender & Geranium Body Wash; Pour under running water for a foam bath or use all over the body in the shower. For frequent use. In case of contact with eyes, rinse with clean water immediately. If irritation occurs, stop use. Keep out of reach of children.